Last December I joined philminiracers‘ Classic Mini Championships at the Clark International Speedway. It was the last round of the 2011 Season Championships. I joined the drag race and the Women’s circuit race. I came in 3rd in the drag race and 4th in the circuit race. 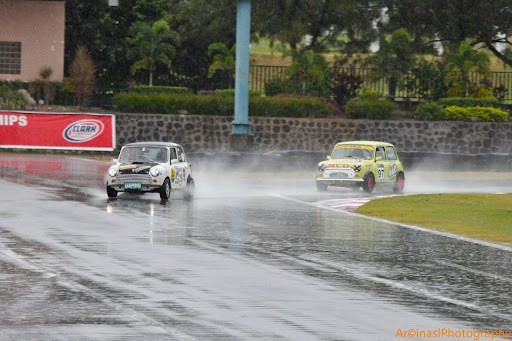 It was a rainy Sunday, still the classic minis raced on the slippery Speedway. That’s me: no.97 mini. I was overtaken on the last turn just before checkered flag! That corner pushed me in 4th place. Awww! I was heartbroken. Huhuhu. Today, the classic minis are heading south to the Batangas Racing Circuit for practice. Tomorrow, April 15, 2012 is race day once again. For those of you who are interested to join or to watch, you can go to the BRC tomorrow. The race will start at 8 o’clock in the morning. Now for the VW lovers : coordinated by Philminiracers, the VW KaFER Cup will hold its first race tomorrow! Round one of the first season. 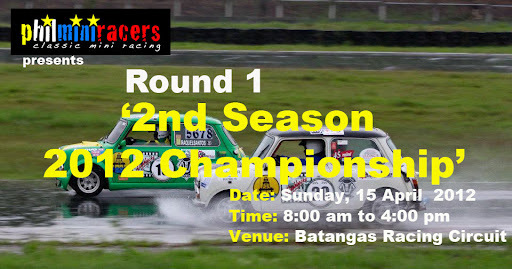 Also at the Batangas Racing Circuit, and alternating with the classic mini races. It’s going to be very fun and exciting to watch. Oh wow!